Casa Catanzaro is a very unique home in Manuel Antonio, surrounded by the flora and fauna of the area, and located in a neighborhood known as Valle Pure Vida (the valley of Pure Life). The 4 bedroom, 4 1/2 bathrooms home can be used as a permanent residence, a rental home with multiple rental options, or both. The top floor of Casa Catanzaro is composed of two main bedrooms, two 1/2 bathrooms, kitchen, living room, and plenty of outside terrace with a refreshing swimming pool and ample barbecue area. The first floor of the Sloth House consists of two separate fully functioning 1 bedroom studios that can be used as part of the residence, or rented out separately to generate residual income for owners that want to live in Costa Rica fulltime. 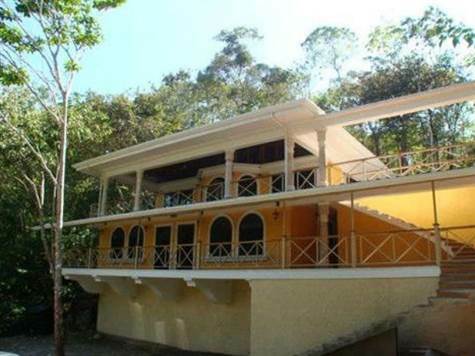 Casa Catanzaro is a newly built house with rental potential and great for any person looking to live in a very tranquil area of Manuel Antonio, only minutes away from the white sand beaches of the National Park.